In a 1920s Bowtruss building, with a few walls built and trusses painted black, we began this rapid paced project to be completed within three weeks. The building is one of several single story buildings on an industrial campus co-located with the corporate headquarters. The VER Camera building faces west toward San Fernando Road, a busy four-lane street which parallels Metrolink tracks with the loud train horn sounding regularly. 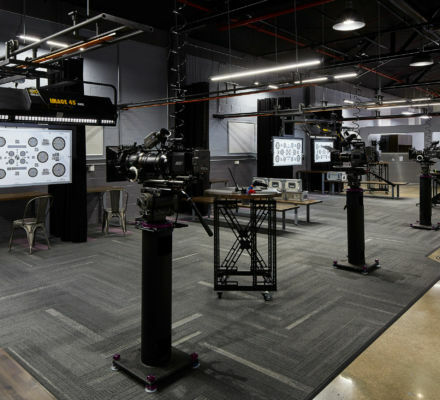 The move was part of a series of coordinated moves to bring two parts of the Camera division to the campus, equipment inventory, staff areas and client-facing spaces. It is a temporary project, as the corporation is planning to relocate all divisions to a nearby airport. The move schedule date was set, design began and schedule shifted based on client lighting selections. The client has a requirement for flicker free, 5000K daylight spaces, and preferring LED source. The schedule shifted to accommodate new major client assignments and large-scale preps, when product availabilities were solid. It was an ever-moving target, while the design marched forward steadily. ‘Street cool’ design features in the space took rise from the essential elements of the client. 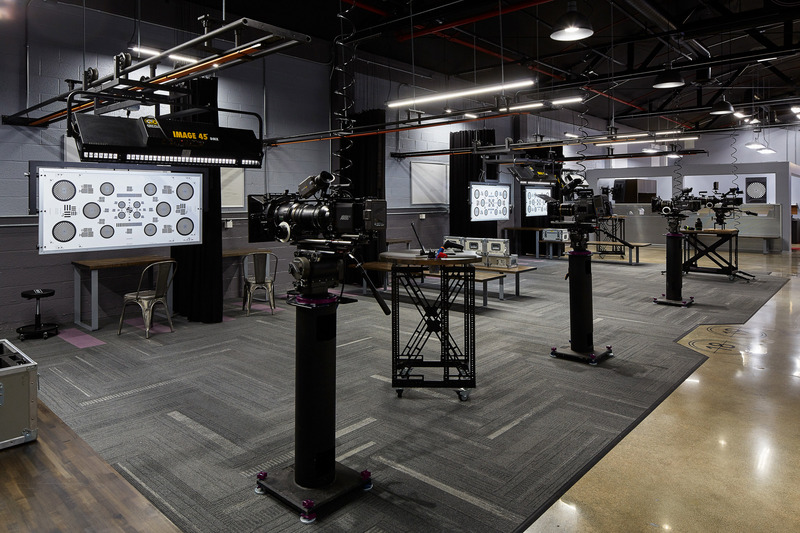 Simple black unistrut organized the ‘ceiling plane’ supporting the focus chart rails for digital imaging prep bays where the highly detailed, plumb focus chart travels along the rail system, as focus is pulled and verified. The beginning of spatial branding was accomplished with a call out to graffiti artists, to increase branding words and slogans with graffiti, tagging and alphabetic wild style artfully done on the bathroom walls, launching enthusiasm for the new urban garage. Stacks of thin aluminum water-jetted scrap with X-frame cutouts lined dumpsters, and were quickly repurposed for the project. The 4’x 4’ X-frame material played large in the custom design of mobile prep tech carts and battery racks. End grained and dovetailed butcher block, the go-to material of choice for this case laden space, was purchased in sizes to create modular furniture: client desks, benches, tables and a conference credenza. It was stained in two shades of grey, one for the prep bays and another deeper shade for the client areas. In the credenza, the client’s own newly redesigned cases were used as the body of the credenza, showing off their own products. The benches used client products as sled bases easing the relocation across carpet planked prep bays. 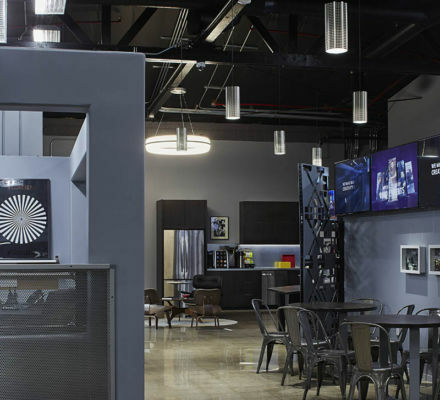 High-end cameras exhibit edgy automotive design, with perforated aluminum screens at vented elements; so similar focal points in the space were framed out of modular framing materials called 80/20 and contained panels of the perforated material. In-house resources like 3D printing and manufacturing of parts completed the design. Mobile prep tech ‘off the grid’ workstations complete with their own battery host a laptop, with custom recesses for markers and camera stainless steel rods. Matching the shadowy stain is custom European millwork with galvanized metal counters, providing client touchdown, lunching and lounging areas. Bolts dress the assemblies. Rollup doors provide the industrial character with blackout curtains hung on air craft cable separating and providing the ultimate flexibility for the 20 prep bays to expand or contract for a single digital imaging camera or a multitude of reality cameras. The newly mobile prep techs were aided by real time interaction and constant communication from clients via mobile iPad enabled prep bays. Given the project’s overnight schedule demands, J S D A generated the design as the drawing was being done, and drafted all of the construction drawings by hand within a few days; transmitting the drawings to the general contractor. Budgeting for the project was requested after drawings were done. Within an 18-hour period, the designer produced an estimated budget for all ideated design elements that represented a complete project, together with art and accessories. The budget was adopted by the client and became the benchmark for the project. Several weeks into the project, the general contractor was removed from service. The client realized the amount of labor needed would require the hire of temporary laborers. Four temps were required for four weeks, but they came without tools nor specific construction skills. Extraordinarily, J S D A guided the construction, showing the laborers how to measure, cut, and install. The client made runs to Home Depot for tools. Adding to the industrial character of the space, J S D A decided that all conduit would be surface mounted and gave the electrical contractor the freedom sought. The project was a success, on budget, on schedule and exceeding the quality expectations of the client and ‘setting a new bar’ for the industry. 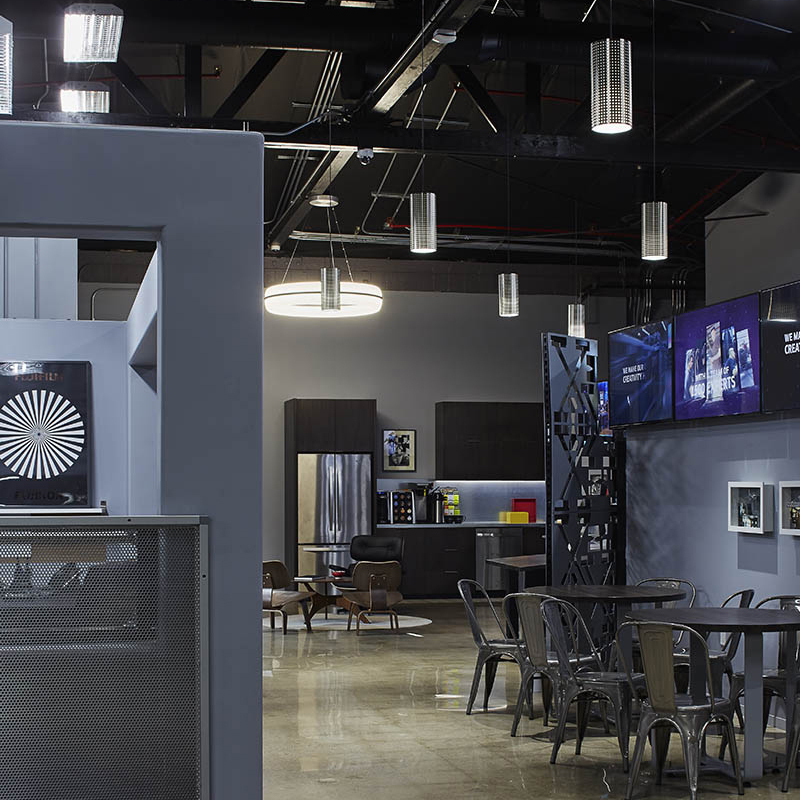 This project represented the best definition of partnership, a collaboration of trust between designer and client, utilizing the best of in-house technologies, representative branding and products toward a fulfilling space that is thrilling to clients upon setting set inside the space. The client’s branding message is a “can do” and together, we did.